I spent a decade trout fishing California’s western Sierra Nevada. Being a California resident I’m used to tons of fishing pressure, weekly trout plants and lots of 10-inch rainbows. Two weeks ago, on my first trout fishing trip in Northern Georgia, I felt at home. On our way back to Atlanta from Rock Creek, we opted to make a few casts in Cooper Creek and weren’t disappointed. Situated more than 2,000 miles away from Cali’s heavily stocked trout steams Cooper Creek meanders through the Chattahoochee National Forest and mirrors many of the streams found in Central California’s Sequoia and Sierra National Forest; it’s loaded with public access and salmon egg eating rainbow trout. Driving through the winding roads the North Georgia Mountains are known for, it didn’t take long to learn that this creek gets a ton of day use from people living in the greater Atlanta area. 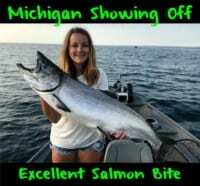 Even during the week, every pullout was occupied, campgrounds were packed and anglers lined all the good-looking pools. Being a low gradient stream, Cooper Creek didn’t do a lot of tumbling and had very little whitewater, nevertheless, it was rich in pools, small runs and had plenty of pockets to pitch salmon eggs into. 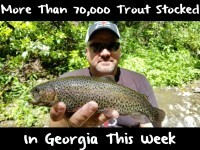 As many times as I’d been to Atlanta, I was shocked to see such a rich trout stream and dozens of anglers fishing it. Meanwhile, I wasn’t sure how many fish were left in the system. According to the anglers we chatted with, the stream hadn’t been stocked this week (and it was Friday afternoon). They told us it had been hit hard and seen a lot of pressure since the opener, just a few weeks prior. My other buddy, Richard Weekley, chimed in, too. Weekley was holding a jar of Gold Label Pautzke salmon eggs. 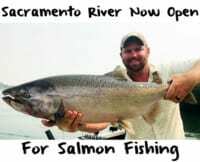 In fewer than 30 minutes, he and our group of five walked down to the stream and caught a half-dozen 10-inch rainbows with the red, glittered salmon eggs, ironically fishing an area a group of three anglers told us they combed well and didn’t get bit. Cooper Creek is a perfect spot to drift salmon eggs. The water isn’t too fast. It moves at an ideal speed, and has just enough current to get a natural drift and allow the eggs to tumble along the sand and gravel bottom. We practiced this technique just above Cooper Creek Campground, as well, and caught and released another half-dozen trout in 30 minutes using this technique. As clear as this water is, however, I’d recommend using two-pound test, four tops. Anything heavier and you wont get bit. Trout stocking is in full swing right now in Northern Georgia. Cooper Creek should continue to get 10-inch planted rainbows for the next few months and those fishing in the vicinity of Cooper Creek Campground can expect easy limits of pan size trout – if you pitch Gold Label eggs, like we did. Editor’s Note: Chris Shaffer is the Director of Operations at Pautzke Bait. He is, however, a big Georgia Bulldog fan and will be returning to Georgia to trout fish in late September and attend the Georgia/LSU football game.